Everyday, we wear brands without thinking about wear they came from, how they became popular, or who created them. We wear brands such as UGG’s, which only became popular in the United States because of the 1994 U.S Olympic Team. However, many people don’t know certain, interesting facts about popular brands, such as that the founders of Adidas assisted in the Nazi war effort, which eventually led to them becoming business rivals with Puma. The creator of the blue jean, Levi Strauss, moved to California to open a dry goods store for Gold Rush workers and ended up creating the most popular pair of pants in the world. Lastly, many owners of Hunter boots don’t know that the brand itself was only created due to World War I and the soldiers need for boots. Most of the brands we wear have unique backstories which have made them into what they are today. One of the most popular boots sold today, UGG’s, did not have any major breakthroughs until 1994 when the boots were worn by the U.S. Olympic team. One year after the boots became popular internationally, the founder, Brian Smith, sold the business to Decker Brands for $14.6 million. Then, the brand really started to take off, experiencing substantial growth for several years. The boots gained massive popularity and they even opened up several brick and mortar stores worldwide. The second biggest publicity that the brand received was from Oprah Winfrey. In 2003, Oprah included the boots on her segment “Oprah’s Favorite Things”. During the show, Oprah bought 350 pairs of UGG boots for her audience and staff causing a massive global boost in sales of the boots. She not only increased the boots popularity among everyday people, but even celebrities, such as Jennnifer Lopez, Cameron Diaz, and Kate Upton, started to wear them. This style of marketing allowed the UGG brand to experience unprecedented growth. Adidas began during World War II and was founded by brothers Adolf (Adi) and Rudolf Dassler. The company was originally called Dassler Brothers, before the two brothers had a falling out. The Dasslers both joined the Nazi Party prior to the war; Adi supplied shoes to the Hitler Youth movement and to German athletes at the 1936 Olympics. Many people also believe that Adi Dassler used Russian prisoners of war to help in his factory due to the labor shortage caused by the war. Rudolf Dassler was then forced to serve the German forces in Poland; this not only made Rudolf angry, but he believed his brother, Adi, had something to do with it. When the war ended, Rudolf told the Allies that Adi assisted the Nazi war effort and from that point on, the brothers hated each other. Rudolf then broke off from Dassler and opened his own shoe store called Puma, which lead Adi to rename his store Adidas; the companies have been rivals ever since. Levi Jeans were created by Levi Strauss when he was just twenty years old. He sailed all the way from Manhattan to San Francisco in 1850 to seek a fortune during the California Gold Rush. During his journey, it is said that he carried a roll of canvas in his baggage. Supposedly, he intended to sell it to a tentmaker to get enough cash for a loan, but when he arrived in California, the complaint of a friendly miner gave him a better idea. The minor told Levi Strauss that the pants he wore wouldn’t last long in the hard labor conditions, so Levi Strauss then went into the clothing business. He had a tailor cut a pair of trousers from his canvas roll and soon the miner was strolling all over town, bragging about how strong his pants were; he called them the “pants of Levi’s.” With one happy customer, Strauss realized he had an untaped market of minors who wanted “Levis.” In a shop in San Francisco, he began making dozens of pairs of the waist-high overalls, which resisted the wear & tear of gold-mining and plain ordinary living. While there are many different versions of how Levi Strauss created the first pair of blue jeans, this one is by far the most interesting. 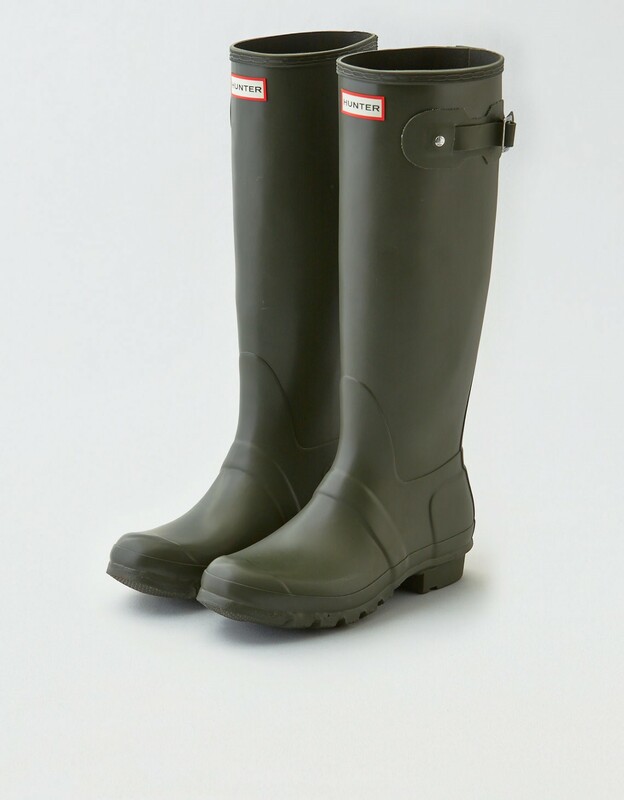 The most unique start to a company was by Hunter boots. The production of Hunter Boots not only increased substantially, but also became a well known company in 1914 with the outbreak of World War I. To protect soldiers stationed in the trenches, the War Office commissioned sturdy rubber boots to be made. The rubber mill ran 24 hours a day to keep up with the demand and, over the course of the war, manufactured over 1 million boots. The British Rubber Company was recognized for their protective designs and thus were called upon again in 1939 after the outbreak of World War II. During the second World War, 80% of the companies’ output was for the war. The news of Hunter boots dependability quickly spread after the war was over. The boots then became a popular staple among the general public in the following years.